Description: The Left Cliff of Owls is a fairly big cliff, quite featured, and a bit over 250 feet tall at the highest, with routes up to 4 pitches long, many spectacular. All types of climbing can be found here except wildly overhanging jug hauls (though there are still plenty of steep, exposed routes). At present, this cliff has the most completed pitches of the two main cliffs (abt. 50 as of 2011). There are some great slab and face routes, like the Right Cliff, particularly on the Alaskan Wall and the White Owl Face, but The Left Cliff is notable for it's many aretes, corners and crack systems. The main plane of the wall faces south south-west, so you can climb till late in the day. Some of the belay ledges give great views of the sunsets looking west towards The Captain in the distance. Directions: Get the basic directions from the Owl's Cliff main page. The approach trail drops you off pretty much in the middle of the cliff. You will see the lower bolts of "Owling Good Time", a nice 5.9+/10a just to the left, leading up a shallow corner above a ledge. If it is not wet it is a good single pitch introduction to the cliff, with some stemming at the bottom to limber up, pockets and a corner crack to get you in the gear plugging mode. Heading left from this route, above the trail, you will see an alcove with a big dike in the back, home to "The Smoky Dike" and to it's right, "Ruffled Feathers". Due to it's convenient bolts and location, RF is often used for a warm up in the morning despite it's crumblyness. Left of The Smoky Dike, is the RGC-Open Spaces sector, a tall section of steep wall defined by the boundaries of the start and finish of the 4 pitch RGC (Roger Gagne Classic) a superb 5.8+ route, that would be a great way to get to know this part of the cliff. It works it's way up and right across the wall, with great climbing and incredible positioning. The route finishes up the hanging pillar up and left of the dike. The start is a few hundred feet left, 50 feet past where the pathway narrows and you step up onto a flat boulder and into a corner. Above the boulder is the wide crack in a corner that marks the start of a number of the cliff's classic mulipitch routes. Past the RGC, you will come to the 100ft. bolted arete of "Butolicious" 12a/b. High above it, there is a giant slot at the top of the cliff, with a huge flake making up the right side that looks like Texas. This is the beginning of The Sporty Owl Area, home to big corners, aretes and cracks, which runs left to the sharp bolted fin of "Talon" 12a. Just past "Talon", the cliff makes a 90 degree turn and runs up the hill, gradually diminishing in height, with the face turned towards Sawyer Pond, then returns to the main plane as a much shorter cliff, before breaking down. Just beyond "Talon" is high and quite dramatic, but the rock quality is considerably less than the rest of the cliff, suffering from crumblyness. Halfway up this side wall is the bolted route "Bird's Eye View" 5.10, that gives this section it's name. Going right from the approach trail, you pass under a short wall with cliff above, and up to where the cliff makes a huge corner. From the Smoky Dike to here is The Alaskan Wall, named after the superb 12a "Alaskan Slab". Another quality, all bolted line here, that goes at a bit easier grade, is "Lonesome Owl" 10c, Owl Cliff's granite version of Rumney's "Lonesome Dove", just left of the corner. 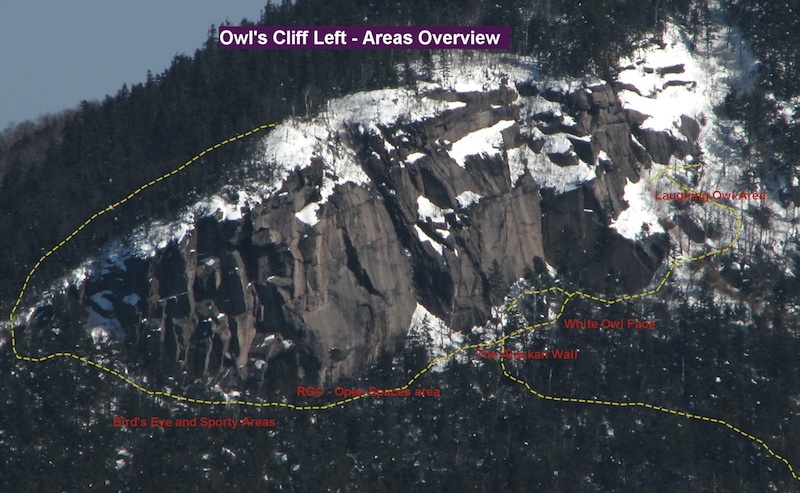 The shear wall to the right of the corner is The White Owl Face, home to a number of super classic one pitch Owl's test pieces, including Brady Libby's 12c finger crack, "Crack of the Future", Ward Smith's sport routes "Owl Cliff Club" 12b/c and "Attack of the White Owl" 5.13, along with Jerry Handren's�"White Owl" 11d/12a, another of Owl's�excellent finger cracks. Around to the right and above The White Owl Face is the tall buttress of The Laughing Owl Area, which includes the slab to the right. The trail takes you around the lower portion of the buttress and up to the upper part, dropping you off at the level of the start of the cracks of "Egg Cracker" 5.10 and "Laughing Owl" 5.9, plus the slab that makes up the right end of the cliff. This area contains the most concentrated moderate climbing of the cliff including "Bubbles" 5.6, a crack in the slab leading to overlaps, and the fun slab to a seam of "Aquarium" 5.8. Those putting routes up at this cliff have striven to clean them well, place good quality 2 bolt SS anchors with sturdy quicklinks, bolt where necessary, but use traditional gear when able without being fanatic. So you should find most climbs well protectable, which isn't to say there wont be opportunities for flight time. Use your judgment. Off set cams and nuts are good to have for some of the flaring cracks and a clipstick should be occasionally used. The nature of the routes and the set up of the anchors means that you can climb and descend most with a single 60 m rope. Rapping is preferred to protect the top of the cliff.